Whether you spell your name D'Egville or Degville, if you are part of the D'Egville family then you share common ancestors who came to the British Isles in the mid-eighteenth century. This blog shares the latest research into the D'Egville family history. 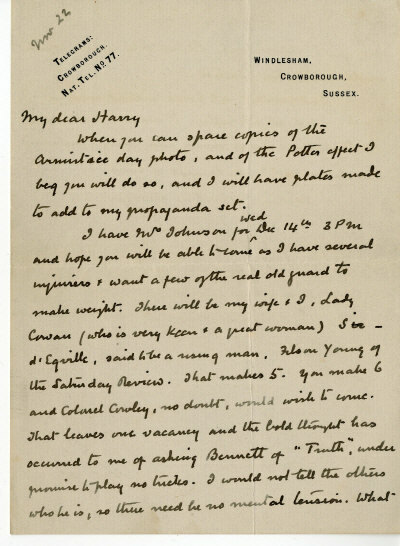 Lot 193 in an auction held at the Radisson Edwardian Hotel, Heathrow on 16 May 2009 was a series of four letters from Sir Arthur Conan Doyle. They are undated but refer to a séance held on Wednesday 14 December. The letter below was sent in advance of the séance and has a pencil annotation "nov." We know that it occurred in 1921 because the journalist Filson Young was invited to take part. 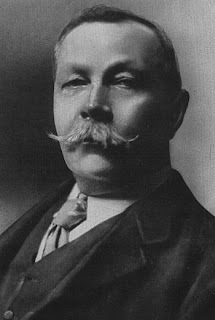 Young described the proceedings in an article "Hymns and Humbug" published in the Saturday Review on the 21 January 1922. A zinc trumpet had been placed in the centre of the participants and when the lights were extinguished spirit voices were heard from around the group. The trumpet was about four feet long and when Young placed the trumpet out of reach of the other participants no more voices ceased. After Young wrote personally to Conan Doyle explaining that the participants had been duped and the article appear Conan Doyle waged a war of words against Young. This is consistent with Conan Doyle's behaviour on other occasions when his beliefs were challenged (see The Secret Life of Harry Houdini: The Making of America's First Super Hero William Kalush and Larry Ratso Sloman, Pocket Books, 2007) . The fouth person listed in the planned company is one d'Egville, "said to be a rising man." I'm uncertain to whom this refers. Young's biography (Filson Young: The first media man (1876-1938), Silvester Mazzarella, date unknown) quotes that a ‘public singer’ was present. It will be interesting to try and discover whether d'Egville attended and who he was. I won't be organising a séance to garner evidence from primary sources.